Manora is situated 65 km from Thanjavur, on the shores of the Bay of Bengal is Sarabendrajanpattinam village, about 20 km south of Pattukottai town. 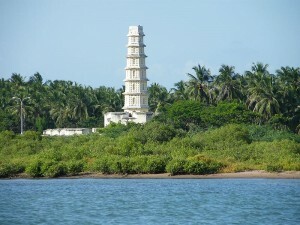 Manora is a grand old town with lovely architecture and scenic surrounding. There is a historical monument of note here. Manora is a memorial tower built in 1814 A.D. in commemoration of the Victory of British army over Nepoleon Bonoparte, the French Emperor, in the historic “Battle of Waterloo”. Manora is a pleasing blend of Roman pillar architecture. The sea, the breeze and the fisherman’s houses make Manora a nice place to visit. This entry was posted in Manora, Tamil Nadu. Bookmark the permalink.